Alex Fischer, the new COO for Wimberg Landscaping, recently spent some time with us to share a bit about what brought him to Wimberg and what he has to offer to our teams and our clients. How has your past work experiences prepared you for your responsibilities at Wimberg Landscaping? Prior to joining Wimberg landscaping, I spent 20 years working within the finance, consulting and investment banking industries. I have worked with companies ranging from large multinationals to small businesses all within service-based industries and sectors. Throughout my career I have focused on creating value by developing and executing multi-faceted strategic plans within the areas of operations, finance, expense reduction and risk mitigation. While your role is behind the scenes, how do you see what you do day-to-day impacting our clients? During my career, I have learned the exponential value of positive and productive work cultures and their impact on the success of any business. The initiatives and solutions that we will develop in the coming years will continue to expand and grow all of our resources at Wimberg Landscaping. Allowing us to deliver exceptional client service. Our goal - Happy team members equals happy clients. Has working here inspired you to tackle your own landscaping project? Working here inspired me to expand my knowledge of all things green and share the experiences and knowledge with my daughters. We have always spent time outdoors at the Cincinnati Nature Center, Ault Park and many of the other great outdoor spaces but we now make frequent stops to take pictures and discuss the things we see. On a recent trip to Boston, we spent several hours at the Boston Public Garden (Boston Commons) exploring the awesome surroundings in the middle of a busy downtown area while reading the tags on trees and plants. 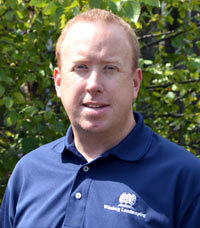 What impresses you about Wimberg Landscaping teams, our projects or client retention? I am impressed with our excellent client retention, tenure of team members and the depth and breadth of services and projects offered and completed.